From Goodreads: Wrapped in darkness and woven with defeat, every action Chase has taken since being exiled from the Circle has been met with a devastating response. Now he’s been burdened with a quest that seems impossible, and he needs to evolve into something more, something greater than he ever thought he could be. 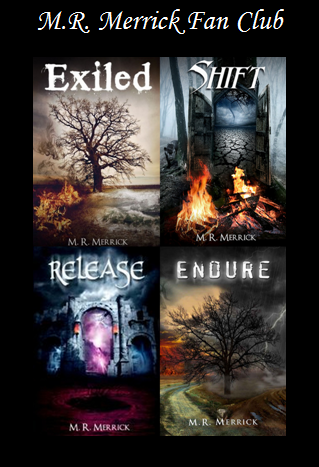 The final chapter in The Protector series, Endure, is the best yet by young adult author M.R. Merrick. Full of fantasy, romance, and battles of epic proportions, the story captivates its reader from start to finish, lingering in their hearts and minds long after the last page. Chase Williams is back, as determined as ever to stop his father, Riley, from achieving the resurrection of the god Ithreal, an evil force none will be able to subdue should Riley succeed. And up until this point, Chase has failed, and failed hard, to keep evil at bay and his father away from the artifacts that will help him unleash the worst of the gods upon every dimension in the universe. Weak from the loss of his best friend at the hands of Riley and the dark Brothers, Chase must learn to overcome his own feelings of loss and blame, letting go and realizing that he can’t control others and that sometimes, death is meant to be. Though there are many passages that wrench reader emotions, Merrick offsets the sad and gloomy with triumphant and blissful, creating a great ambience for readers as this epic saga concludes. Whisked from dimension to dimension, Merrick captivates with his portrayal of these strange worlds where the inhabitants differ so much from those of the human spectrum, painting incredible pictures of the people, or monsters, as some describe them. The worlds themselves differ in vast array, from red grass, to blue moons, each world is unique and unrecognizable to the human eye, and this wonderful creation of Merrick’s is one of the many aspects that I love so much about his writing. Though I am unable to visualize what other dimensions and worlds would look like on my own, Merrick has shown me his rendition in such vivid color and detail that I am able to see his creation with little difficulty, and as the story progresses and readers learn about the inhabitants, their aggressions, and their attempts to aide or hinder Chase on his way to full protector status, the story unfolds into a beautiful tale you won’t want to miss. I highly recommend this novel, and the entire series, for that matter, to any and all who enjoy strong characters, fantasy, world-building, and an all-around good YA read. Five stars. To read how M.R. Merrick came up with this phenomenal series, click HERE. Collect all 15 letters as you visit all the stops of the Endure tour (link below). Unscramble the letters to make a 2 word phrase that will get you entered to WIN a $50 AMAZON gift card! M.R. 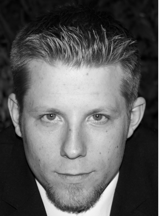 Merrick is a Canadian writer, and author of The Protector Series, four books in all. Having never traveled, he adventures to far off lands through his imagination and in between cups of coffee. As a music lover and proud breakfast enthusiast, he’s usually found at the computer, between a pair of headphones and in front of a large bowl of cereal. Click here to go to the Rafflecopter Giveaway! I received a review copy of Endure from the author in exchange for an honest review. I”ve got to get my hands on this serious. Each cover is more beautiful than the next! So true! I own two in paperback and can’t wait to get the others! They are gorgeous!!!! So glad you enjoyed it! I’d love to control Fire. It’s so beautiful and destructive.